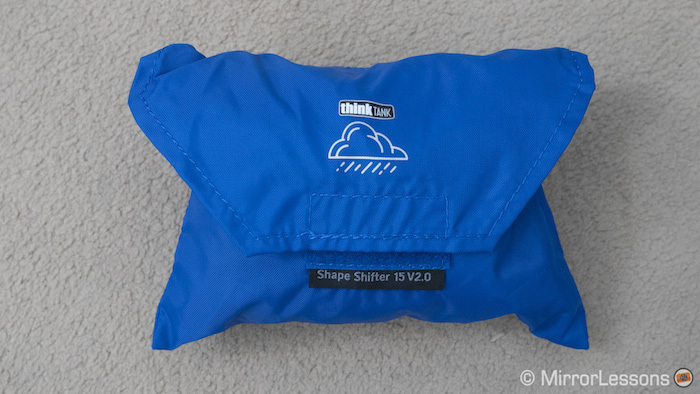 The Think Tank Shape Shifter series is one of Think Tank Photo’s most popular thanks to its ability to expand and contract to suit the amount of gear you are carrying. The original Shape Shifter came out in 2009 and was recently updated to Version 2.0, which features a handful of improvements over the previous model. 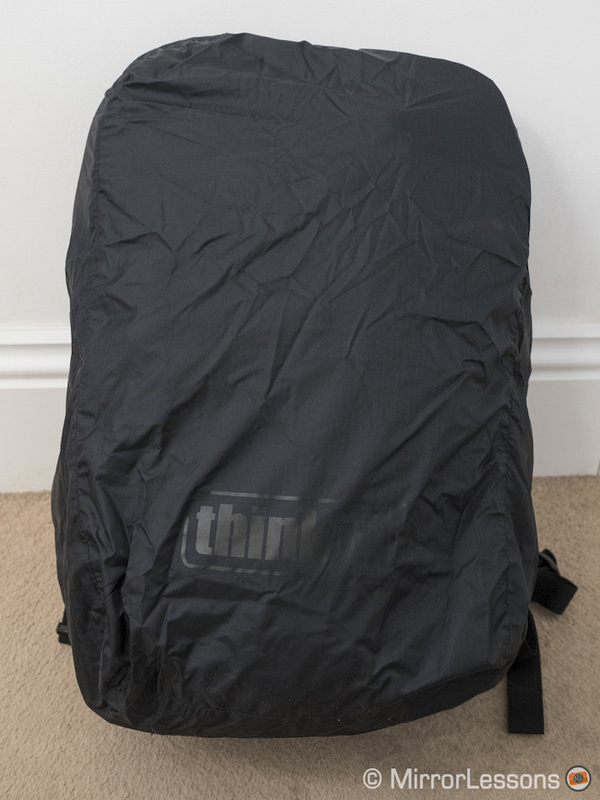 Though I’m not new to Think Tank Photo products, I admit that I never had the chance to try out the original Shape Shifter backpack. 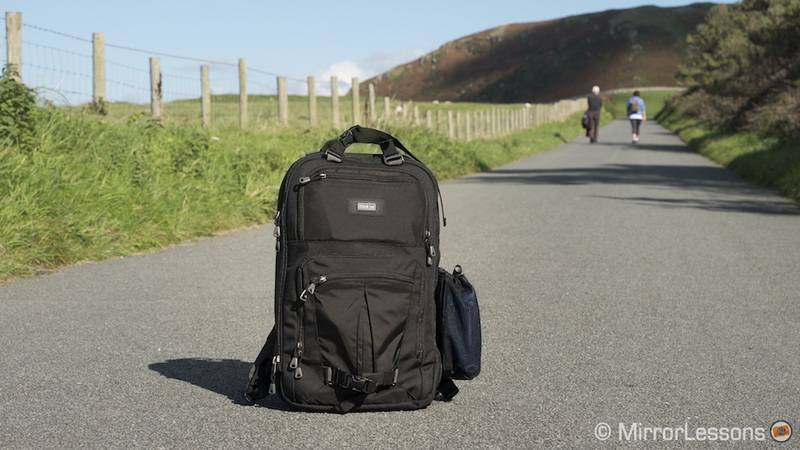 As such, I’ll be giving all the bag’s features, both new and old, equal importance rather than just focusing on the new features and drawing direct comparisons between Version 2.0 and the original. Who is the Shape Shifter for? 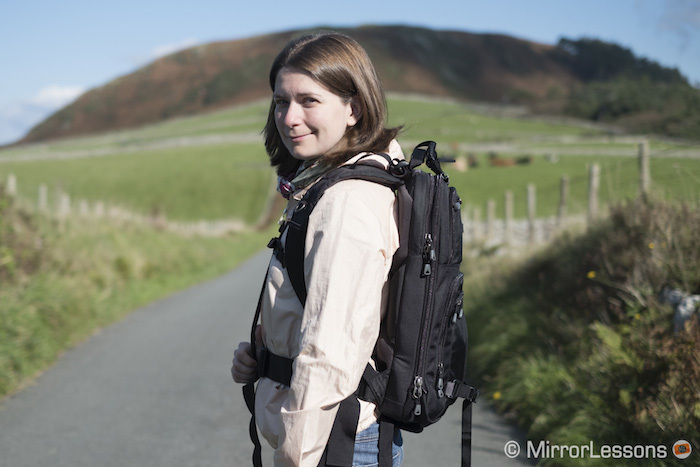 Designed for travelling photographers who are always on the go, the Shape Shifter 15″ can expand to accommodate up to 4 mirrorless cameras, 3 lenses, a 15” laptop and a large tablet, or contract to a mere 8cm in depth for those times you wish to keep a low profile or when you’re using your gear instead of transporting it. There is also a larger version which will accommodate a 17” laptop and even more photography gear but since our focus is the mirrorless niche, I requested the smaller 15” version to review. A unique characteristic of the Shape Shifter is the dual zipper. 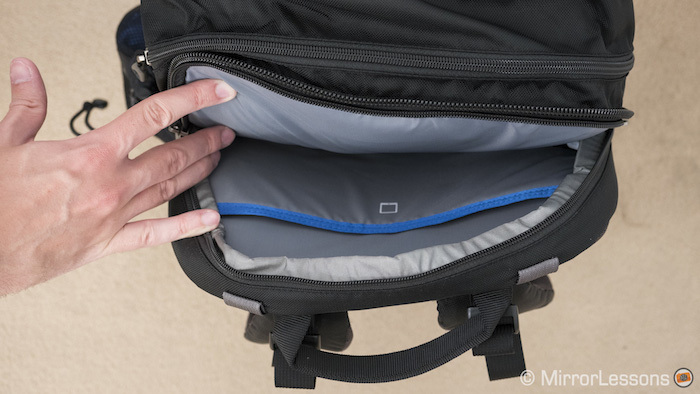 The first gives you access to the main compartment, while the second compresses the bag, making it slim and easy to carry around even in crowded areas such as a train or airport. 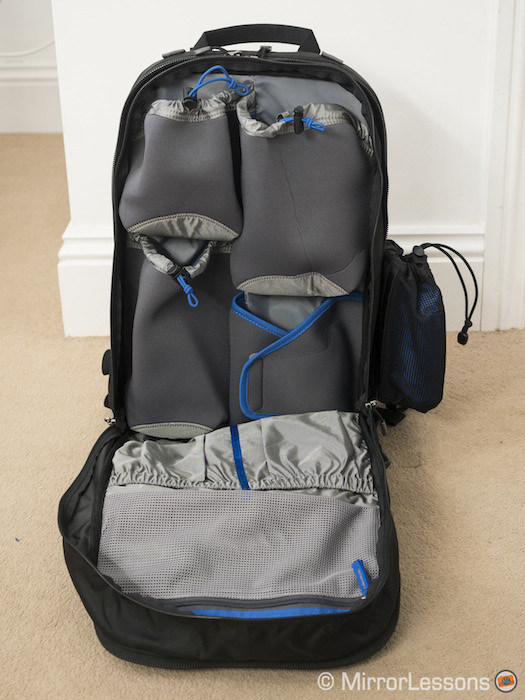 For long trips, you can also choose to store the compressed bag inside a larger suitcase so that you can use it once you’ve arrived at your location. 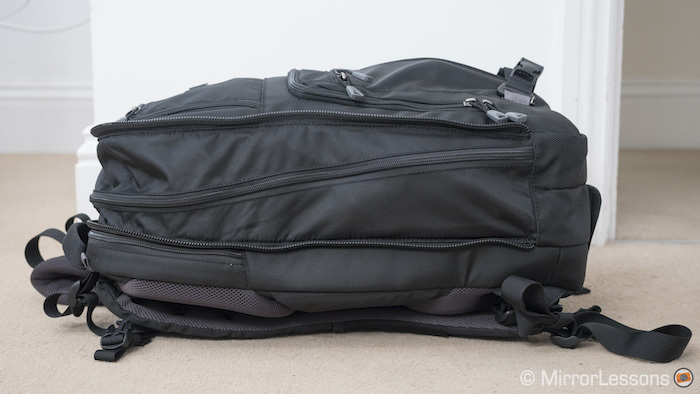 The fact that you can either expand or compress the bag means that it can serve as both a serious camera bag and an everyday backpack to carry around your laptop and documents. In true Think Tank style, the Shape Shifter comes with a plethora of pockets around the bag. 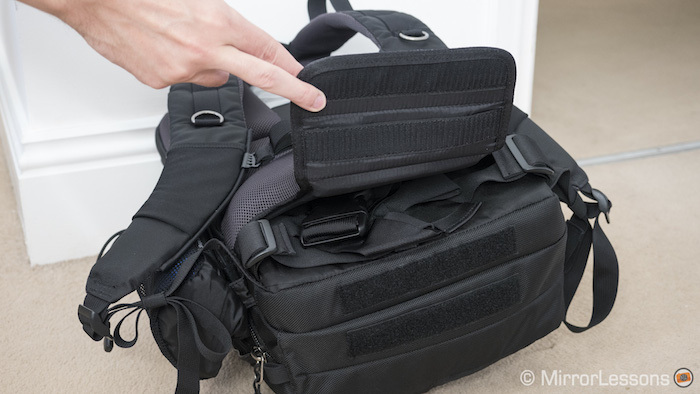 There are four on the exterior and five on the interior, not to mention a number of soft dividers and three grey pouches inside the main compartment for your camera gear. These pouches are made of soft neoprene, close with a tie and feature a blue interior so you can easily locate dark-coloured accessories such as lens caps that fall to the bottom. 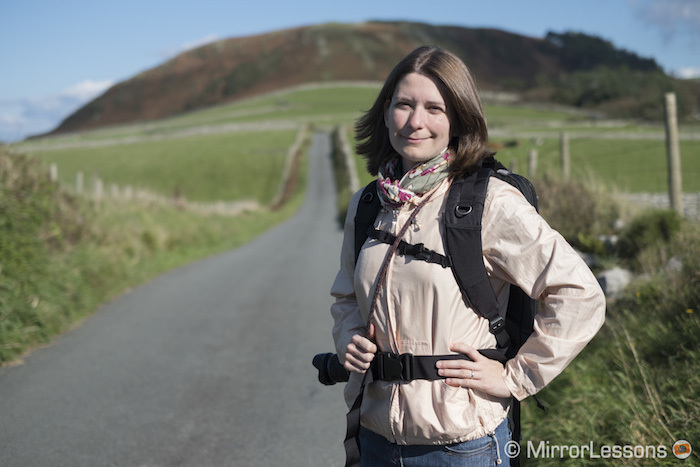 Since they’ve been designed to accommodate DSLRs, they are more than big enough for mirrorless bodies. They are also much less bulky and take up less space than traditional foam dividers. 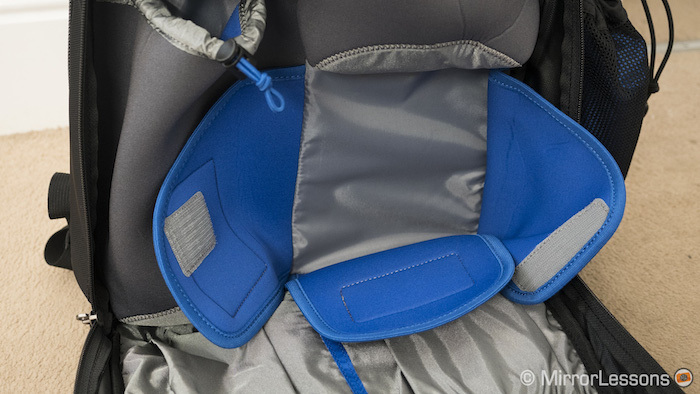 Accompanying the three pouches is an additional neoprene wrap whose size can be adjusted to fit irregular-shaped gear. 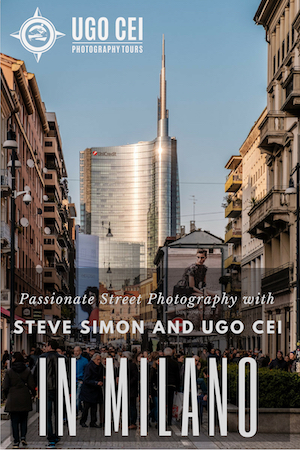 It is big enough to fit a large mirrorless camera with a medium-sized lens. Turning to the rear, there is a very spacious laptop compartment where you can store both a 15″ laptop and a large tablet at the same time. It is also handy for carrying around important documents that need to be kept flat. 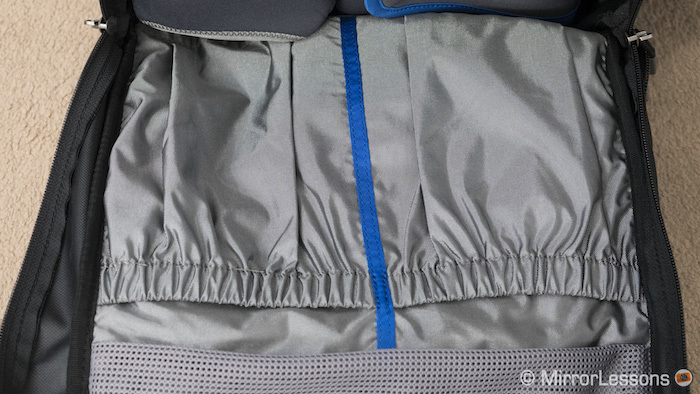 To one side, we find a removable mesh pouch for a water bottle. Honestly speaking, I’ve been using it to store everything but water, including receipts, maps and the provided rain cover, but it is good to know it’s there! 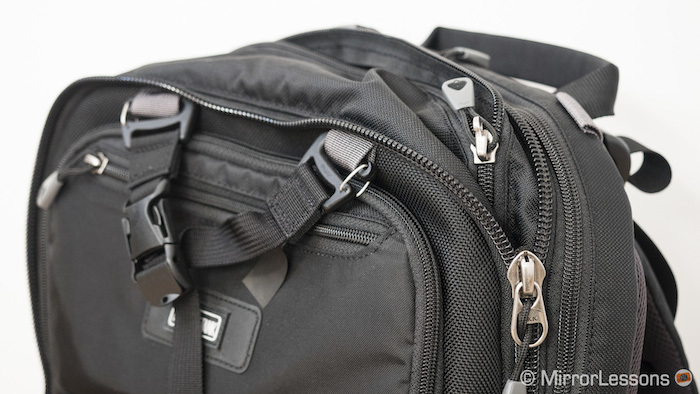 If you plan on carrying around a tripod, you’ll notice that there are two adjustable straps stored inside the bag for this purpose. All you have to do is attach them to the nylon rings on the top and bottom, and secure them around your tripod. 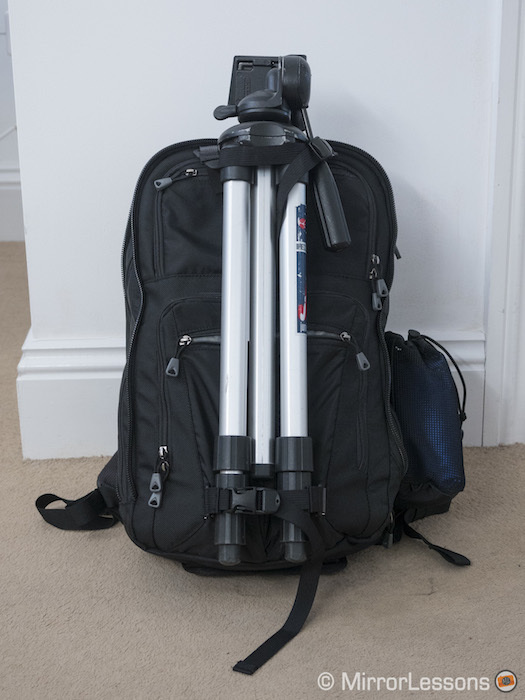 Note that one of the tripod legs must be placed inside the front zippered pocket to stop it from sliding, so it is best not to keep any breakable items in that area. 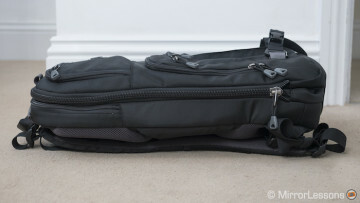 When it comes to space for your gear, Think Tank really seems to have all the bases covered with the Shape Shifter. 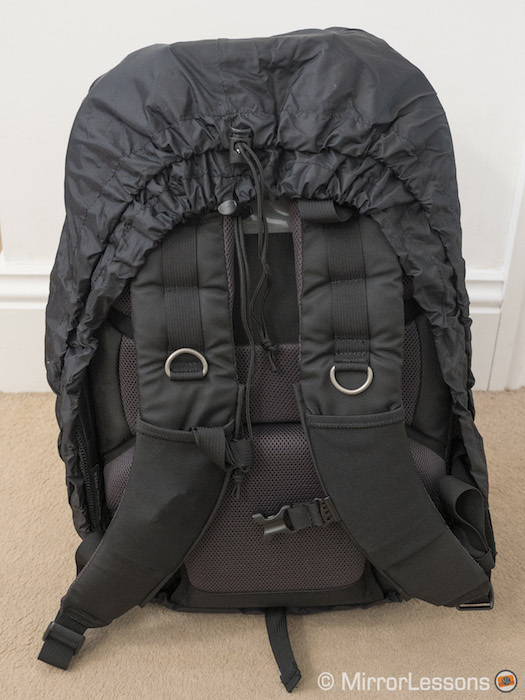 In fact, the only comment I can make is that perhaps there are too many pockets, making it easy to lose track of smaller accessories if you can’t remember where you’ve stored them! Comfort in a backpack is of massive importance to me as I often suffer from shoulder and back pain due to long hours in front of the computer. 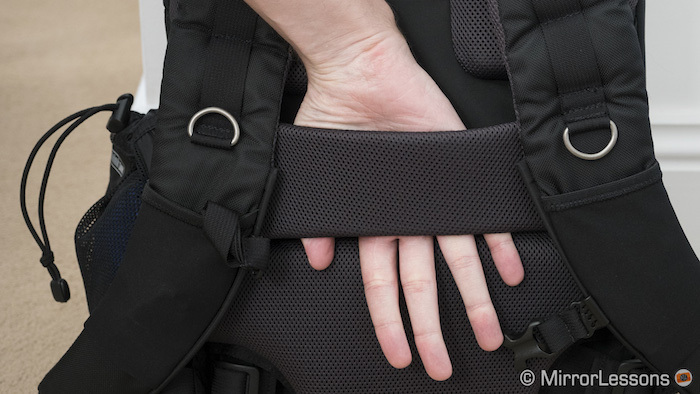 The good news about the Shape Shifter is that all areas that come into direct contact with your body are well-padded, from the contoured shoulder harness to the rear of the bag. Even if you’re carrying a lot of heavy gear, the bag does an excellent job of distributing the weight so that one particular part of your body is never put under excessive pressure. Usefully, there is a padded pass-through sleeve on the rear through which you can slide the handle of a rolling suitcase. Although the bag already benefits from a durable water-repellant coating, it also comes with an additional rain cover that fits the bag to a tee. 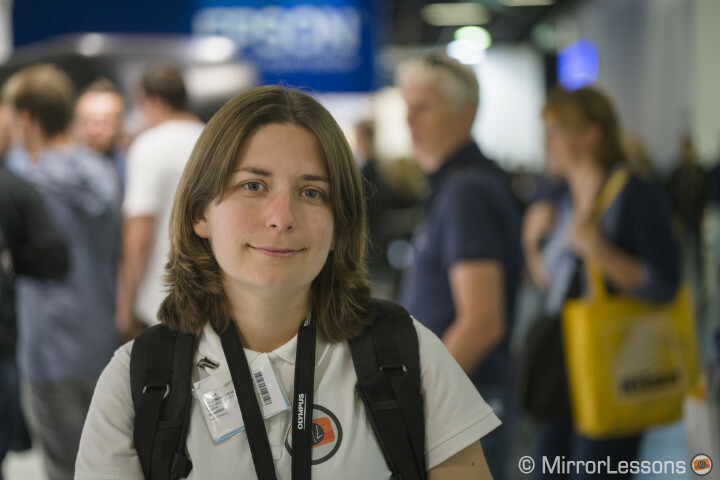 To give you an idea of just how versatile this bag is, let me tell you a bit about how I used it during Photokina 2016. 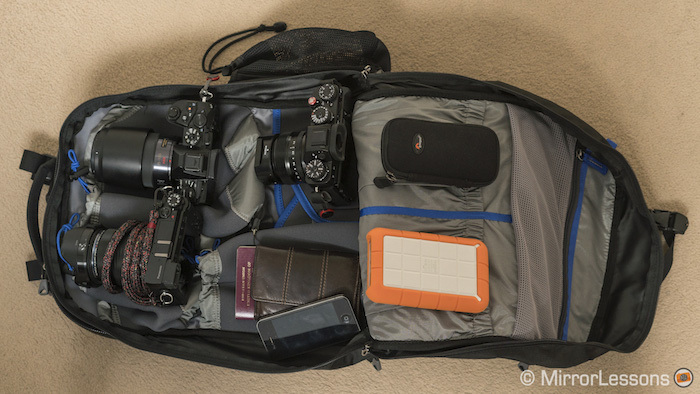 While travelling from the UK to Cologne, I used the bag to transport three mirrorless bodies (the E-M1, GX85 and X-T2), three lenses (the M.Zuiko 12-40mm f/2.8, Lumix 35-100mm f/2.8 and XF 35mm f/1.4), a 13” laptop, some clothing, my wallet, keys, phone and passport, and a number of camera accessories including memory cards, an external hard drive, and a couple of chargers. Being a budget airline, there wasn’t much space under the seat in front of me. Still, I had no trouble sliding the bag underneath even though it was packed to its maximum capacity. 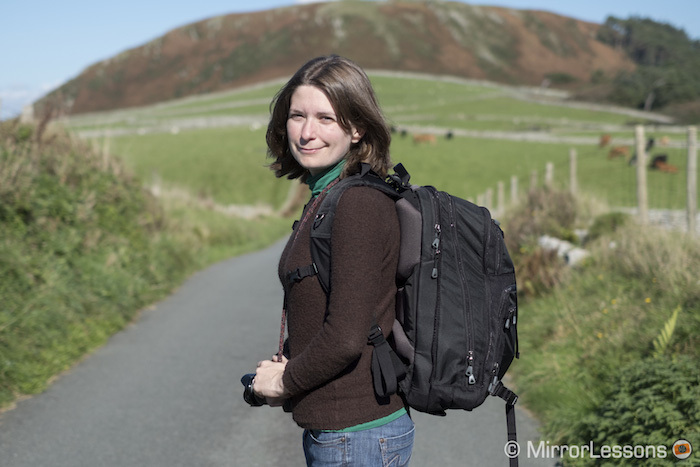 Once we arrived at the hotel, I reduced my gear to the essentials, removing all the clothes, extra accessories and camera gear I didn’t need on that particular day. This allowed me to flatten the bag with the second zipper and maintain a low profile while walking around the crowded halls. 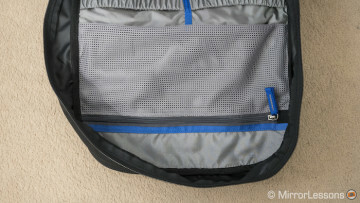 The extra zipper also gave me peace of mind, as I knew it would be difficult for anyone to reach inside the bag and abscond with my belongings! During the show, I often used the laptop compartment to store the large press documents I received at the various stands. To store smaller items like business cards or memory sticks, I used the smallest front pocket. 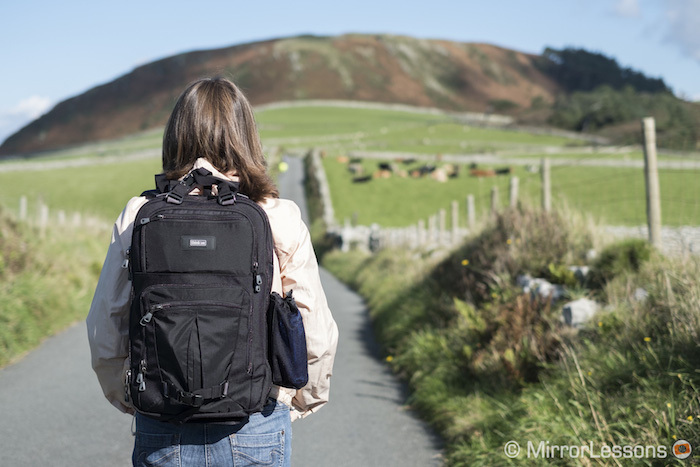 Even though I wore the backpack for five days straight, I experienced no shoulder or back pain at the end of the event thanks to the comfortable padding – though admittedly I was very tired from all the walking we did! 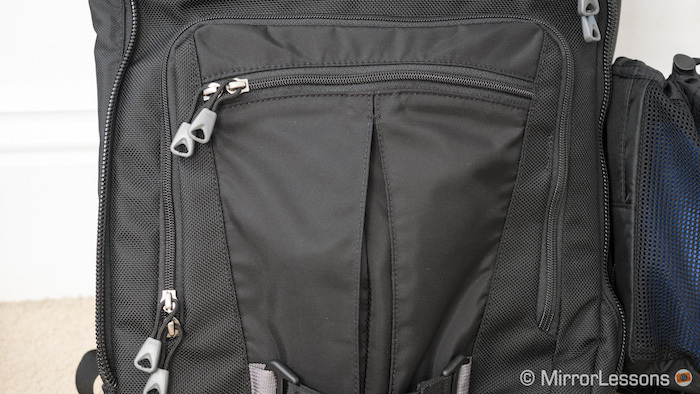 This is quite a testament to the bag’s ergonomic design, as many other backpacks I used in the past caused me some degree of pain after carrying them for an extended period. 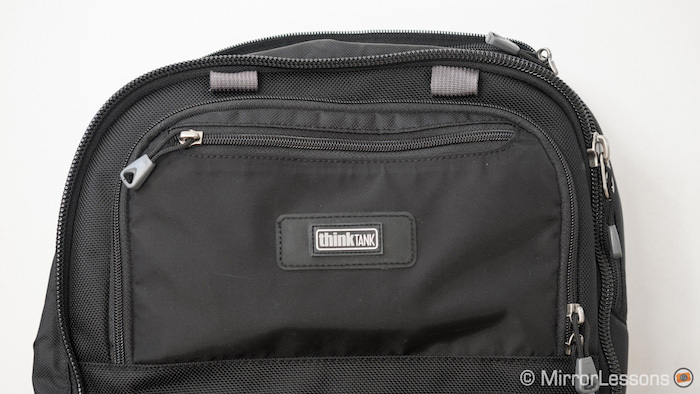 Think Tank Photo is one of my favourite bag companies because their bags, in addition to being extremely comfortable, provide lots of versatility, from the number of pockets placed around the bag to the multiple ways in which they can be used. 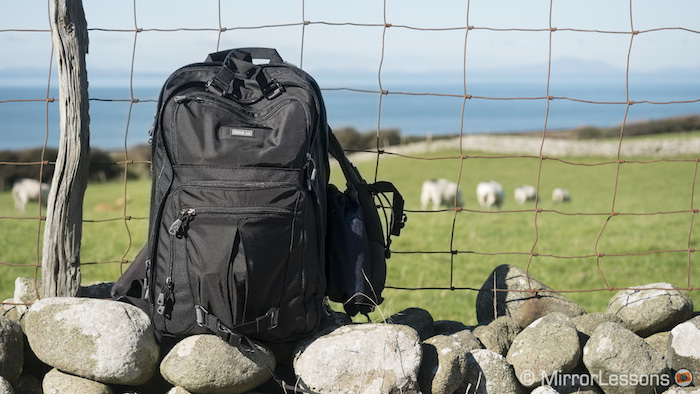 The Shape Shifter Version 2.0 exemplifies these traits with its ample storage space, comfortable shoulder and back padding, and ability to transform from a heavy-duty camera backpack into a slim, streamlined laptop carrier. 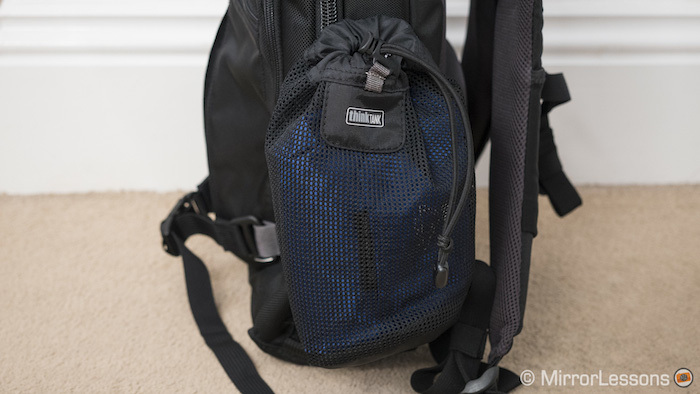 If you’re in the market for a new backpack, you’d be hard pressed to find a better alternative at this price point.